Nationally recognized medical researcher Dr. Kenneth Cameron, left, has been named the United States Sports Academy’s 2017 Dr. Ernst Jokl Sports Medicine Award winner. 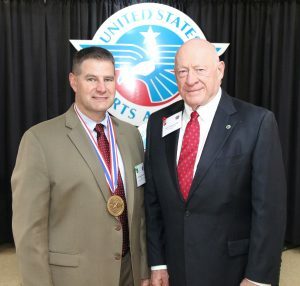 Cameron was presented the honor by Academy Trustee Dr. Don Wukasch at the Academy’s 33rd Annual Awards of Sport celebration held recently on campus in Daphne, Ala.
DAPHNE, Ala. – A nationally recognized medical researcher known for his work in injury prevention and treatment of athletes and people in military service has won the United States Sports Academy’s 2017 Dr. Ernst Jokl Sports Medicine Award. Dr. Kenneth Cameron was recently presented this year’s award by Academy trustee and cardiothoracic surgeon Dr. Don Wukasch of Austin, Texas, at the Academy’s Annual Awards of Sport celebration on the Academy’s campus in Daphne, Ala.
Cameron is director of Orthopaedic Research at Keller Army Community Hospital in West Point, N.Y., where he holds faculty appointments with the John A. Feagin Jr. Orthopaedic Sports Medicine Fellowship, the U.S. Army-Baylor University Sports Physical Therapy Doctoral Program and the Uniformed Services University of the Health Sciences. Cameron’s primary research interests are in the areas of injury prevention, musculoskeletal injury and disease epidemiology, and outcomes associated with the treatment of these injuries, specifically in physically active and military populations. His work has resulted in numerous research awards. The Dr. Ernst Jokl Sports Medicine Award, named in honor of the former Olympic athlete, international sports medicine scholar, and director of the University of Kentucky Rehabilitation Center, is given annually to an individual for his or her contributions to the growth and development of sport medicine through practice and/or scholarly activity. The individual should exhibit a mastery of some aspect of sports medicine through practice or research, be well known in the sports medicine field and have an abiding belief in and practice of ethical behavior in pursuit of knowledge. Cameron was selected to participate in the U.S. Bone and Joint Decade Young Investigator’s Initiative in 2007 and he has subsequently served as a principal investigator for grant funded research projects supported by The Orthopaedic Research and Education Foundation, The National Athletic Trainers’ Association Research and Education Foundation, and The U.S. Army Medical Research and Material Command’s Post-Traumatic Stress Disorder and Traumatic Brain Injury Research, Peer Reviewed Medical Research and Peer Reviewed Orthopaedic Research programs. He has also worked as a co-investigator/site principal investigator on projects funded by the National Institutes of Health. Cameron has authored numerous peer reviewed manuscripts and has presented his work nationally and internationally. Cameron earned the Commander’s Award for Civilian Service in recognition of exemplary service to the United States Military Academy in 2004 and the Department of the Army Superior Civilian Service Award in 2014. Cameron has earned several research awards, including the Arthritis Foundation’s New Investigator Award, the Johns Hopkins School of Public Health MPH Capstone Research Award, the Society of Military Orthopaedic Surgeons Founders’ Award for the best scientific paper with military relevance, the American Medical Society for Sports Medicine Research Award for the Best Scientific Research Paper presented at the AMSSM annual meeting, the American Orthopaedic Society for Sports Medicine’s Best Scientific Poster Award, Aircast Award for the Best Clinical Science Paper submitted by a sports medicine fellow, and the O’Donoghue Award for the best overall paper which deals with clinical based research or human in-vivo research. In 2015 Cameron earned designation as a Fellow in the National Athletic Trainers’ Association (NATA) for exemplary scholarship and service and in 2017 he earned the NATA Most Distinguished Athletic Trainer award recognizing exemplary professional service at the district and national level.  Cameron previously worked as the director of research for the Glendale (Ariz.) Union High School District and as a certified athletic trainer and instructor for the United States Military Academy’s Department of Physical Education at West Point. Cameron earned his bachelor’s degree in exercise and sport science from Oregon State University in 1993, his master’s degree in exercise science from San Jose State University in 1996, and master’s and doctoral degrees in educational psychology and methodology from the University at Albany in 2001 and 2004. Cameron also completed a master’s degree in public health from the Johns Hopkins University Bloomberg School of Public Health in 2011. The Dr. Ernst Jokl Sports Medicine Award is part of the Academy’s Awards of Sport, which each year honor a wide range of accomplishments in sport and serve as “A Tribute to the Artist and the Athlete,” in conjunction with the Academy’s American Sport Art Museum and Archives (ASAMA). The awards recognize these men and women through the Sport Artist of the Year, Honorary Doctorates, Medallion Series, Distinguished Service Awards, Outstanding Athletes, and Alumni of the Year awards.